Love stories never go out of fashion, especially when they are narrated using songs and drama. The story of Laur and Chanda, is one such story. The folklore is performed till date in Uttar Pradesh, Chattisgarh and some parts of North India. 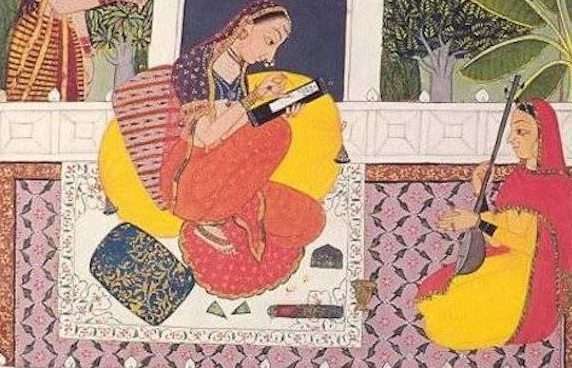 Many moons ago, somewhere around 1377-78 AD (the Sultanate Period), a Sufi poet, Maulana Daud composed this narrative in Avadhi, giving birth to the first surviving Indian Sufi romance. A reason why I am drawn to museums is because they are a storehouse of stories. I chanced upon the story of Laur and Chanda at the Government Museum & Art Gallery, Chandigarh. A delicate set of folios, the Museum has a great book on the collection. Laur enters Chanda’s bed chamber. The narrative begins with the birth of a beautiful Chanda to King Sahadeva of Govar. While still very young, she is bound in wedlock to a blind and impotent Prince. The great beauty that brought her this lamentable fate also releases her from it, for the unhappy maiden catches the eye of a wandering ascetic, Bajir. Bajir sings her praises wherever he goes and sets the story in motion. His songs arouse the lust of King Rupchand so much so that he forcefully tries to forge an alliance with King Sahadev. This is when our hero, Laur is brought in by the King, to overcome and kill Rupchand; but he himself falls in love with Chanda, though not before achieving his goal. Chanda engages her confidante, Brihaspat in arranging secret meetings with Laur. But the story isn’t as simple, because Laur is married to Maina – who comes to know about her husband’s illicit love and devises ways of winning him back when he elopes with Chanda. 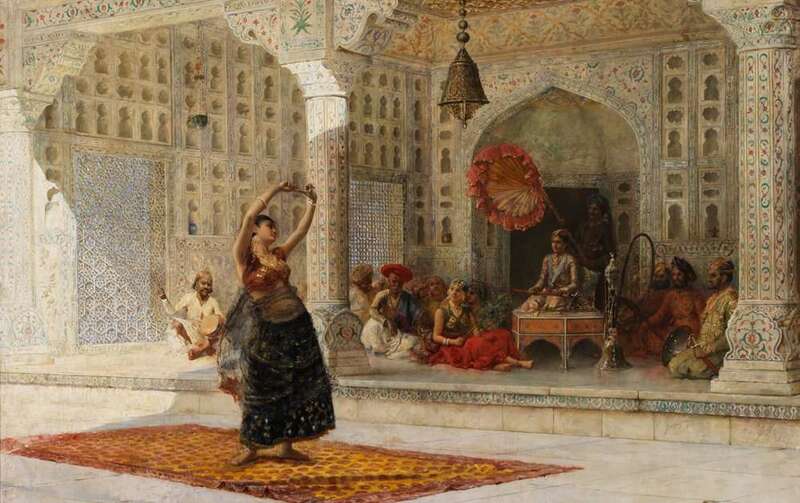 Chanda and Laur’s elopement itself is ridden with challenges – snakebites, thieves and the King Mahipat – who invites Laur to a game of dice and wins everything including Chanda. He is however, outwitted by Chanda and they journey on. Maina on the other hand, entrusts Sirjan, a caravan leader with the task of locating her husband. Eventually Laur and Chanda return but the lovers’ plight does not end with confrontation and Chanda ends up as Laur’s second wife. Read a 21st century social-media retelling of this romantic adventure! The folios of Laur-Chanda are rare and significant in artistic terms. A set of 24 folios have survived, of which 14 lie with the Lahore Museum in Pakistan, and 10 in India’s Chandigarh Museum. The poem by Maulana Daud testifies to his genius as a great storyteller. The artist pays tribute to this very genius by placing him in every folio – almost reminding the viewer of the origins of the story. You will notice him in white with a holy book book in every frame. 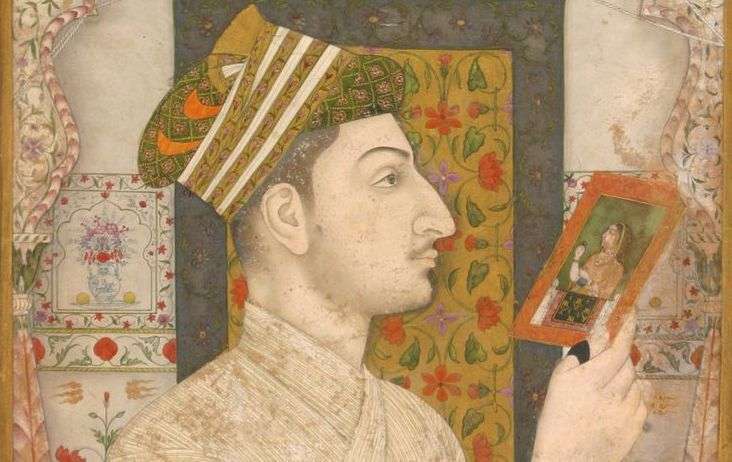 There is no single “Laur-Chanda style” of paintings as there are several series of Laur Chanda miniatures, created over time and all happen to be fragmentary. and across Manchester, Private collections in Jaipur, Bihar, Massachusetts, Berlin and more. Some of the styles are on my Pinterest Board here, and you can see the difference for yourself. Wonderful ! I would like to study these images a bit more and analyse them mathematically. Hi Fatima! Thanks for the suggestion – didn’t realise it 🙂 I’ve listed the museums that have the collection – perhaps that can help? Do share your findings!